The Bhadra Wildlife Sanctuary is situated in Chikmagalur and Shimoga districts of Karnataka. Burrowed in the dense forests of the Western Ghats, Bhadra Wildlife Sanctuary is a known Tiger Reserve. It is also called Muthodi Wildlife Sanctuary, deriving the name from the village on its border. It is spread over an area of 490 sq km. The sanctuary gets its name from the river Bhadra, which flows through the forests. There are two main areas in the reserve namely Muthodi and Lakkavali. 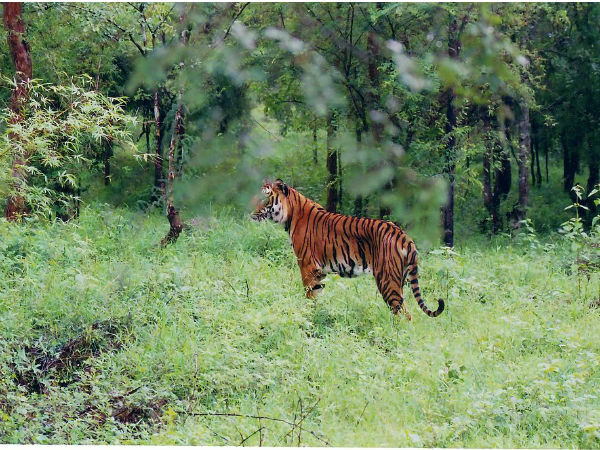 Bhadra Wildlife Sanctuary has a sizeable Tiger population and hence was declared as the 25th Project Tiger by the Government of India in 1998. The highest peak in the sanctuary is Kallahathigiri, situated at a height of 1875 metres above the sea level. The very famous peaks of Kemmangundi and Bababudangiri also fall within the limits of the sanctuary. Best Time To Visit: Between October and February is the best time to visit the sanctuary. Things To Carry: Shoes, binoculars, camera, torch light, snacks, water, hat, sunshades, insect repellant, raincoat, and umbrella are some of the essentials you must carry. By Air: The closest airports are at Mangalore (185 km) and Bangalore (275 km). You can take a KSRTC bus or a taxi to reach the Bhadra Wildlife Sanctuary . By Rail: The nearest railway station is at Kadur, 40 km away from the Bhadra Wildlife Sanctuary. Chikmagalur does not have a railhead. By Road: Bangalore - Kunigal - Channarayapattana - Hassan - Belur - Chikmagalur - Bhadra Wildlife Sanctuary, via NH 75. This takes 5 h 22 min to reach and is 295 km from Bangalore. It is best to start from Bangalore early, because of unpredictable traffic flares. Once you reach Kunigal, you can enjoy the bright sun over Begur lake. The religious centre of Vokkaliga community is Adichunchungiri and it is on the way to Bhadra Wildlife Sanctuary, just after Kunigal. Stop over for a spiritual experience. Shravanabelagola, an important tirtha for the Jains is also on the way. Upon hitting Hassan, stop at Gorur Dam for gorgeous views. The Hassanamba temple is very famous and worth a visit. The circuit of temples of Belur and Halebid is a short detour from Bangalore to Chikmagalur. These temples were built during the Hoysala rule. The architecture and the beauty is simply unparalleled. If trekking interests you, Mullayangiri and Bababudangiri peaks near Chikmagalur are perfect for hikes. Chikmagalur is also famous for coffee, so make sure to buy a kilo or so. Proceed towards Chikmagalur and drive till you reach the Bhadra Wildlife Sanctuary. The vegetation of the forests is southern tropical dry deciduous forests and are mostly moist. More than 150 species of plants and trees grow here. Some of the trees that can be seen here are: Teak, Rosewood, Nandi, Kindal, Tadalsu, Mathi, and Honne. The southern part of the Bhadra Wildlife Sanctuary is plush with birds, butterflies and reptiles. Some of the reptiles found at Bhadra are common vine snake, king cobra, common cobra, common wolf snake, bamboo pit viper, rat snake, olive keelback, Russell's viper, common Indian monitor, gliding lizards and marsh crocodiles. Some of the exotic butterflies here that dance to the tunes of bird songs are blue pansy butterfly, great orange tip, southern birdwing, tailed jay, baronet, crimson rose, yamfly, bamboo treebrown. The main mammals here at the Bhadra Wildlife Sanctuary are elephants, gaurs, tigers, spotted deer, sambar deer, barking deer, wild boars, panther, mouse deer, sloth bear, wild dog, mongoose, porcupine, jackal, common langur, bonnet macaque, slender loris, and malabar giant squirrel. Many birds that are native to Western Ghats are found here. There are 120 species of birds in the Bhadra Wildlife Sanctuary. Some of them are peacock, partridge, pigeon, parrot, peahen, munia bee eaters, green imperial pigeon, great black woodpecker, malabar emerald dove, southern green imperial pigeon, great black woodpecker, malabar parakeet, hill myna, black winged kite, Indian tree pie, black napped flycatcher, malabar whistling thrush, hornbill, racquet tailed drongo, shama, painted bush quail, grey junglefowl, red spurfowl, and open billed stork. The Bhadra Wildlife Sanctuary is known for tigers and elephants. The tigers here are more on the orange side than compared to their counterparts from Nagarhole or Bandipur. Those are more on the yellow side of the colour spectrum. Some of the activities that you could opt for at the Bhadra Wildlife Sanctuary include jeep safari, water adventures like jet skiing, kayaking, etc., trekking, island camping, bird watching and rappelling.